Thompson Mill Press, 9780988326941, 32pp. 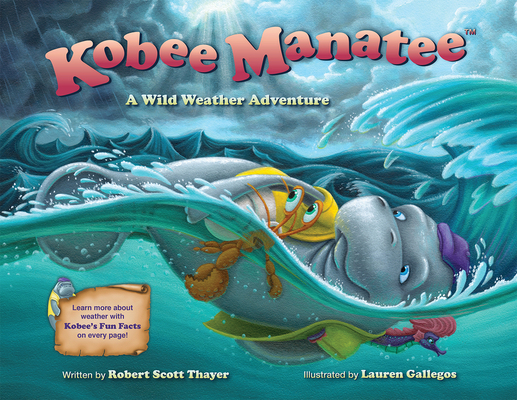 Loaded with surprises and exciting facts about weather, this thrilling tale follows Kobee Manatee as he travels across the mighty Atlantic Ocean into the strong Gulf Stream current . . . during hurricane season! His daring adventure begins when Kobee decides that he wants to surprise his sister Kim, who lives in the Bahamas, on her birthday. Will Kobee and his friends, Tess and Pablo, be able to travel safely from their home in Key West, Florida, through all of the wild tropical weather coming their way? Each page includes in-depth, scientific details titled “Kobee’s Fun Facts,” which expand on the weather events that the characters encounter along the way. Robert Scott Thayer is an award-winning recording artist in the pop, jazz, and children s genres and a member of the Save the Manatee Club in Maitland, Florida. He is the author of "Kobee Manatee: Heading Home to Florida." He lives in Newtown, Pennsylvania. Lauren Gallegos is a children s book illustrator who enjoys hiking and the beauty of nature. She is the illustrator of "Vulture Verses: Love Poems for the Unloved." She lives in Brea, California."